Veterans Memorial Hall, a program of the St. Louis County Historical Society, hosted a public reception and press conference on Tuesday, May 30, at 2:00 PM at the St. Louis County Heritage & Arts Center (Depot) in the Great Hall. The reception celebrated a major redesign of Veterans Memorial Hall to honor those St. Louis County citizens who served in the US military. 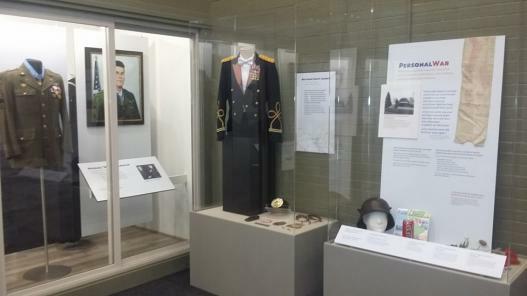 The exhibit serves as a place to learn what these individuals did for their country and for this region. There are many stone memorials in the Northland, but these usually only mention the names of the women and men who died and do not tell the story of their service. 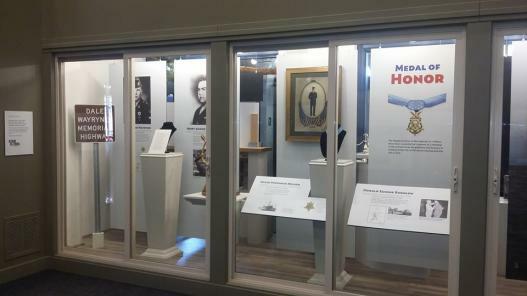 The St. Louis County Historical Society, a premier historical organization in Minnesota, redesigned the exhibit to tell these stories and to encompass all eras from the Civil War to the current Global War on Terror. 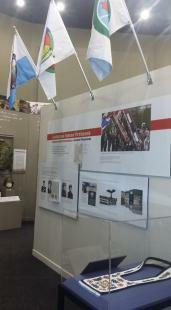 The exhibit includes artifacts and stories from local veterans from all conflicts. 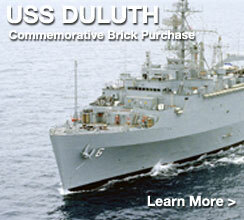 The many artifacts include the Presentation Silver from the USS Duluth on loan from the US Navy, artifacts from the USS Duluth on loan from the USS Duluth Crewmembers Association. Of special note is the redesigned Medal of Honor Row honoring Major Henry A. Courtney, Jr. and four other St. Louis County military men Michael Colalillo, Oscar F. Nelson, Donald E. Rudolph and Dale E. Wayrynen. 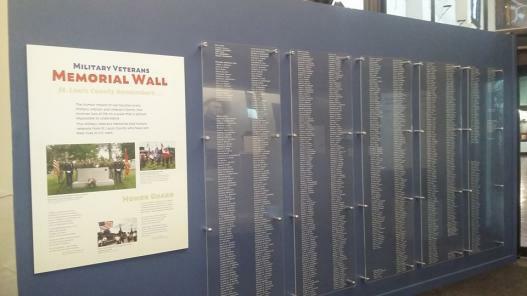 Veterans Memorial Wall honors veterans from St. Louis County who have lost their lives in US wars. 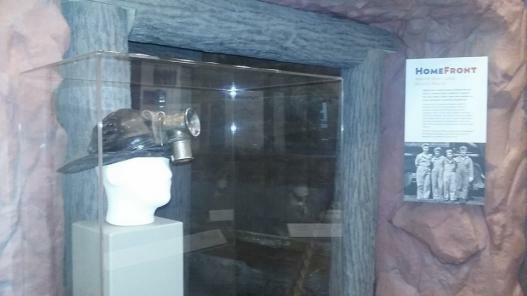 Visitors will also see a rare 1818 twenty star US flag, an expansion of a northern Minnesota iron mine so vital to both world wars, a fife belonging to the last Civil War Union Army survivor, and a hat from the Spanish American War. Also displayed is a decorated WWI helmet, a cup from the USS Paducah and a leather bomber jacket from WWII, an Arrowhead Patch made for men serving in the Korean War, and prisoner of war memorabilia from WWII and Vietnam. Ojibwe soldiers and sailors are honored with a bandolier bag and tribal flags, along with a replica Code Talkers Congressional Gold Medal of Honor. 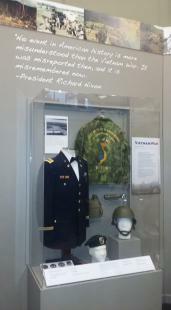 Uniforms and tools used in several Cold War conflicts are part of the exhibit along with uniforms with individual supplies and photographs from Desert Shield/Storm, and a full uniform from a service member of Operation Iraqi Freedom. Veterans Memorial Hall collects and preserves veterans’ stories and artifacts and educates the public on veterans’ history in northeast Minnesota. 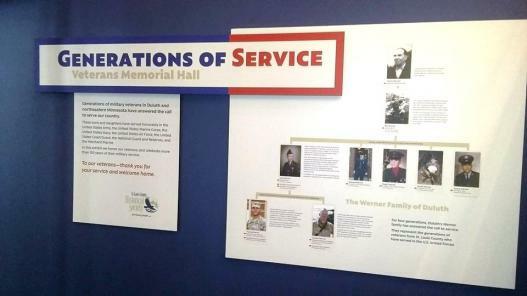 It does this through exhibits and a website (vets-hall.org), which currently more than 7,500 veterans’ stories. 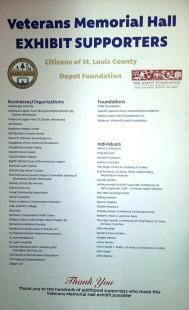 The exhibit was made possible by a generous grant from The Depot Foundation and by the support of St. Louis County.